Description: Honey buzzards have varied plumage but it is mainly reddish-brown. They have three dark bars on the tail, and bars on the underwing which vary from white to dark brown. They have long, powerful wings and a relatively long tail. Male honey buzzards have grey heads with golden eyes. The bill is pointed with a black tip, legs and claws are yellow and their tights are feathered. Female honey buzzards are larger than the male, and have a darker head and upperparts. Juvenile honey buzzards do not have such a distinctive plumage pattern with less obvious barring. They have yellow and brown eyes. Nesting: Honey buzzards build their nest in the same place each year. It is located high up in a tree and both parents construct their nest from small branches and leaves. Honey buzzards lay 1-3 white eggs with brown spots, which are incubated by both male and female for 30-35 days. Chicks stay in the nest for 33-45 days and are fed by both parents and become independent at 55 days. Feeding:Honey buzzards eat mainly bees, wasps and larvae but will aos take works, spiders, small amphibians, reptiles and mammals as well as nestlings. In summer it will supplement its diet with fruit and berries. 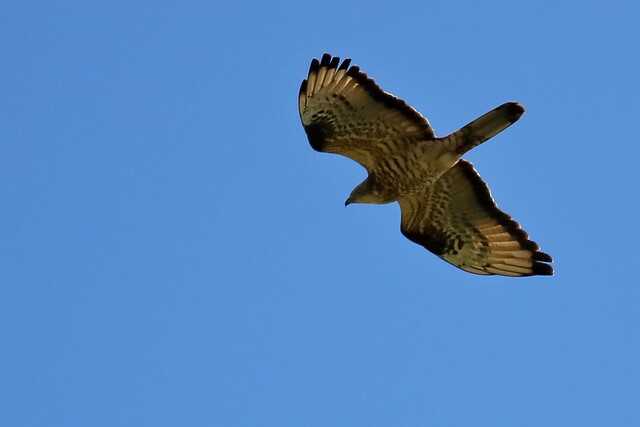 Where to see them: Honey buzzards can be found in southern and eastern England, Wales and northern Scotland. Did you know? Honey buzzards are thought to have a chemical deterrent in their feathers that prevents them from getting attacked by wasps.